Acquiring artwork for your space is a big decision, but it doesn't have to be intimidating. You can schedule a virtual consultation which will provide the opportunity to get to know me, my process and discuss specific, as well as, custom creations that can be designed just for you! 1. Spacial benefits: Abstraction can open up a room or space through composition and color, which can easily pour out of the painting surface and become an extension of the space where the painting is displayed. 2. Versatility: Abstract art allows for the environment to change around it. Abstraction is not thematically stagnant. 3. Ingenuity: Especially in an office setting, abstraction will speak volumes on your business' ability to stay current with todays' trends and interests. 4. Engaging: Art that is not limited by a specific theme allows for the viewers' interpretation and thoughts to play a major role. A peaceful, yet vibrant piece can inspire ideas and a flow that is extremely beneficial in the workplace. It can help to center you for your day, giving you an extra bolt of energy, and add to an overall positive mood. In the healthcare environment, it can help patients and families find a calm and hope in very challenging times. 5. Cultural Relevance: Abstract art developed out of a desire to create and explore the human condition. It is a language that crosses all cultures and experiences. It is art that was created for art's sake, rather than commissioned for a particular royal family or educational institution like the Catholic Church. It is the most open to interpretation and experience. 6. Multiple Applications: Several paintings can be hung throughout a home or office, without the feeling of repetition. Each piece builds on the next to create a small universe unto itself. This will really allow flow, interest and theme to grow and expand, while also allowing for the introduction of additional abstract ideas without creating conflict and preserving the balance that art should bring to any space. Abstract art imposes no limits and provides endless possibilities for any space, whether in the home or office. It comes with a history that has emerged from the very growth of our country. It was the answer to the development of the American psyche after the Second World War, it mirrored the growth of psychology and literature, the bustling post war commercialism, and the need to separate from all of these influences. Abstract art brings a decorative sophistication with a true slice of the American experience. 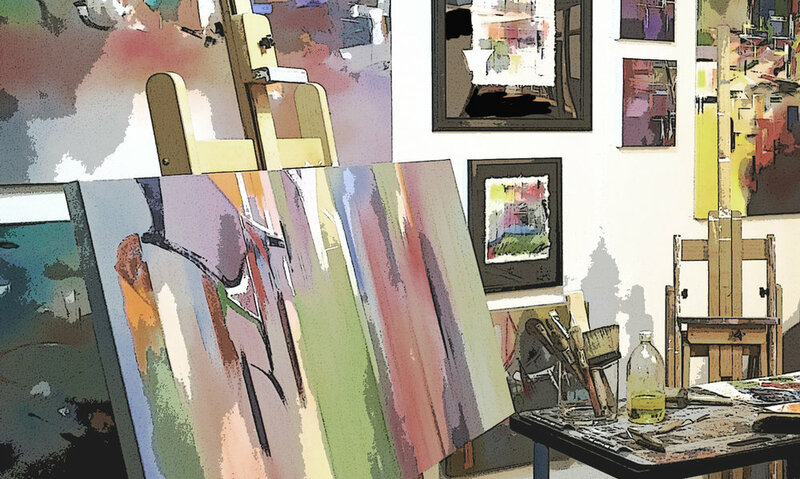 I have an extensive body of work that translates easily into exhibitions for your gallery space. Work can also be created to accommodate your gallerys’ specific needs. Please contact me to discuss exhibition opportunities. To select artwork for your home or project, you can book a personal consultation online or in studio - please contact me for more information. I have been placing artwork in homes and offices for over 25 years. I bring this breadth of experience to the process of art selection for interiors. The understanding that comes from being the creator of the work, blends with an understanding of the overall design concept of the room to make the best possible choices of art for your space. Digital placement of art in your space has never been easier. All that is required is an email or text with photos of the areas in question, along with which pieces you would like to try out in each space. Local clients may book a viewing of the work in your home or office, as well as a studio visit to see my work and discuss the possibilities. Please see the contact page to book your consultation and/or request digital placement of my work in your room/office.